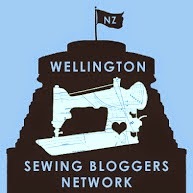 I was to make something for Laulipopnz who blogs here. 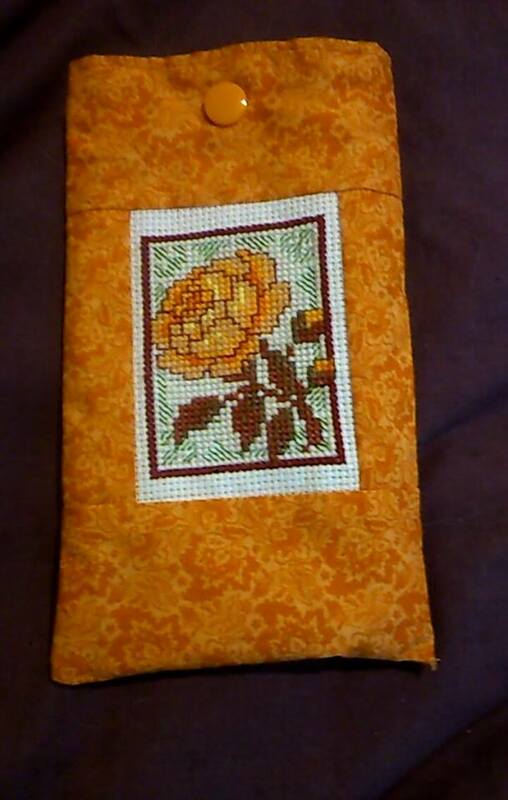 The theme was autumn so those colours etc. I knew that Laulipop liked embroidery so I decided to make something incorporating embroidery. Around the time I was thinking about colours etc we headed north to Paeroa as my Dad was attending his primary school 125th reunion. He was staying with his sister, Aunty J, who I posted about here a while ago. I mentioned that I was making something and asked if there was still an embroidery supply shop in Waihi as I was going to be staying at Waihi Beach with Dad's other sister, Aunty E.
Aunty J never really replied to that question! 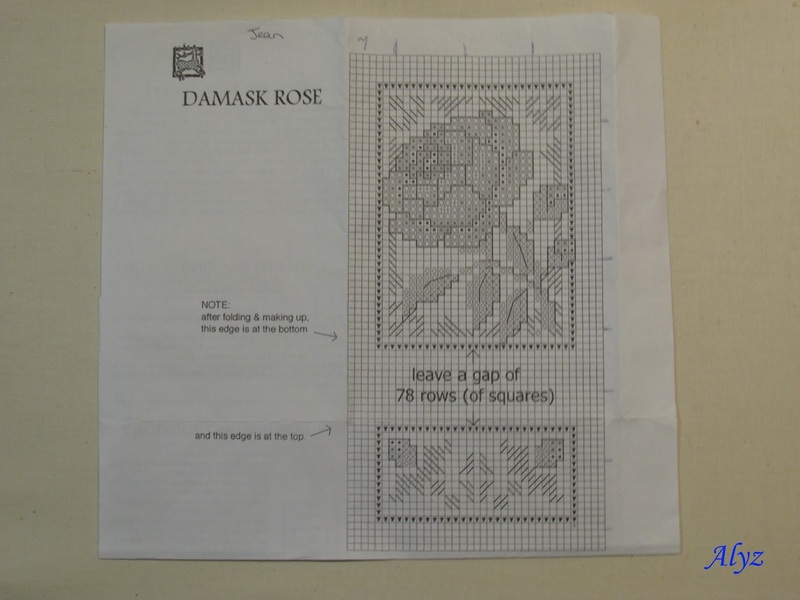 Instead she asked what I wanted to make and delved into her pattern stash! "Here you are, look through these." And then provided me with a pattern as she had duplicates. Aunty J couldn't remember when or where she got it from. Next she asked about colours and passed over a box containing a whole heap of threads . 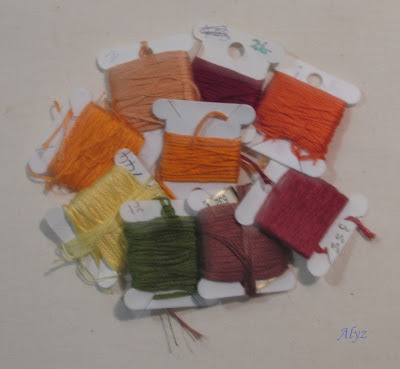 . . most of which were already wound onto floss bobbins. Aunty J told me to choose as many as I wanted. When I said I was happy to buy some I was told very firmly there was no point when she had so many to spare and wanted to give them to me. I chose the number of colours needed and she would have had me take more! Below are the ones I chose. Hmmm pic quality is a bit fuzzy! When it was all complete I packaged it up and popped a packet of tissues in it to give it some oomph. In the end I delivered it to Laulipop's place of work as I wasn't able to make the actual swap meet. Laulipop really liked it and thought it would make a good pouch for her sunnies. Once I was all finished with the gift I had made I arranged to pick up the one that had been made for me. It had been made by acharmofmagpies who blogs here. It was quite a big parcel and beautifully wrapped. I did have photos . . . but gone they are! I love it, and it's bright colours add warmth to any room. Right now it is hanging on our lounge room door . . . I wouldn't want to put it outside unless it was a still, dry day. The dry bit might be o.k. but there are not that many still days where we live! 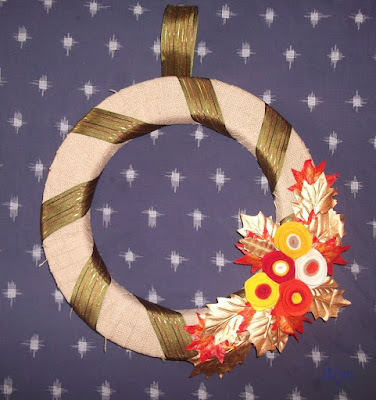 Here is a photo of the lovely autumn wreath. Isn't it gorgeous? 💓 I found the photo on Facebook and since I took it and posted it I reclaimed it! It was fun being part of this Autumn Swap. 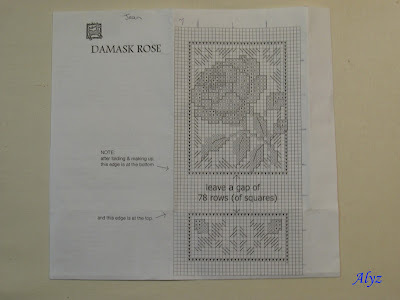 I find it stretches my creativity as I figure out what to make and how to make it, as well as the actual making. Which is always good. Got to keep those brain cells active!